I've got the tank out of our NL320 for cleanout, paint, and reinstall including a sender upgrade. The unit bed/cab NL pickup tank measures 6 5/8" deep from the surface that the fuel sender mounts on to the bottom floor of the tank. Does someone (Wayno maybe) have a tank out of a pickup with separate cab and bed that they could get me a measurement on ?? I know the tanks are different in the filler inlet location but have no idea what else might be different between the two tanks. As stated above, I'm researching an upgrade for a sender replacement and think I have it nailed down for the NL tank. Wayno, if you're sitting in, would you also know if the U320 tank looks to be same as the NL ?? I'll keep the group updated when I get it finalized. I posted this to the truck brothers list but will post it here also. Why are to upgrading your sender Steve? As far as I know the tanks are the same except for the angle the filler inlet, L320s have it angled slightly up while the NL320 has it pointed directly sideways. Both the NL320 and L320 tanks measure out at around 6 1/2 to 6 5/8ths inches from the bottom of the tank to the inside top, the filler necks are in a different location in the tank, and they come out at different angles also, I do not recall what my U320 tank looks like anymore, I had it out but it was a real pain to put back in place. 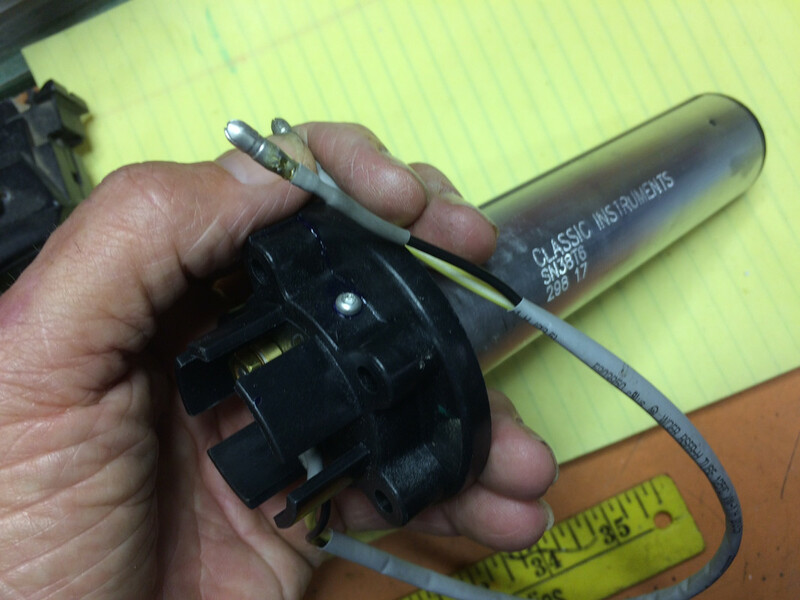 You do know that the Roadster senders are the same as the 320, the early positive ground Roadster tank sender is the exact part that goes on the 320 tanks, the later neg ground Roadster senders work the exact opposite same as the 521, 720 senders I tried, empty was full and full was empty. I just looked at the prices for senders, they are not cheap and they didn't distinguish between positive and negative ground so they would have to be called and asked, I looked at the Ralleye enterprises site, they are the most expensive but they have the parts most the time. Any update on this? difrangia did you find a sending unit upgrade? Sure did. This is a really slick direct drop-in bolt-in upgrade. I actually got this one off Ebay from Summit racing. It'll set you back about $96. Couple bucks cheaper than direct from Classic Instruments. You can get the cheesy float-arm universal type that would could probably be made to work for $20-$50, but this is such a natural clean fix. The float is inside the aluminum tube. Little hole (you can see the lower one in pic) at upper and lower tube to let fuel in/out. Not adversly affected by fuel slosh. Correct 0 Ohm at empty & 90 Ohm at full value. Classic Instruments stock # SN38T6. Comes with nice thick Buna-N gasket and five screws that are wrong thread for 320; they're 10-32 UNF and you'll have to come up with 8-32 UNF screws to suit the tank. You can buy these in a variety of lengths and Ohm ranges. 0-90 Ohm is correct for 320 pickup.